"What is Virtual Reality?" is difficult to explain. Virtual Reality, or VR, is used to describe a computer generated three-dimensional environment which a person can interact with. The experience offered by this 3D world allows a person to become a part of it, allowing them to manipulate surrounding objects. Some VR systems even allow a person to experience additional sensory inputs such as sound or smell, which contributes to the overall effect. Virtual reality promises us an augmented experience with the world around us, is deeply rooted in the concept of escapism, and aims to usher in a new era of scientific discovery and invention, impacting a wide array of industries from gaming, to health, and even fashion. Morton Heilig, also known as the father of Virtual Reality, developed and patented the first true VR System - the Sensorama. Styled as an arcade cabinet, the Sensorama was a film simulator for up to 4 people with a 3D display. It used a combination of vibrating seats, scent producer and even blew wind in the hair to simulate the film environment. In 1982, the Atari Sunnyvale Research Laboratory was founded by Atari Inc. to explore and develop new technologies in digital entertainment. In 1983, the video game market witnessed a massive dip in revenues, leading to the closure of the research laboratory. Tom Zimmerman, who was amongst the laid off employees founded VPL (Virtual Programming Language), a company which then went on to develop the Dataglove, a glove like device which could track the wearer's movement and location at all times, a suit to track body motion named DataSuit and a head-mounted display named EyePhone. Through the late 90's and the early 2000's VR maintained a slow, painful progress. Then, in 2012, Palmer Luckey announced a $300 VR headset named Oculus Rift. Ever since then, the field of VR has seen a sudden spurt in growth, with global technology companies including Microsoft and Sony announcing their own Virtual Reality systems. Developing practical simulations for teaching astronomy, surgery etc. Creating virtual museums, exhibitions etc. Facebook's acquisition of Oculus Rift in 2012, still a nascent VR product for $2 billion, signals a promising future for virtual reality, as it heralds an era of affordable virtual reality applications. 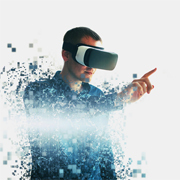 According to Digi-Capital, the market-advisory group, virtual reality software and hardware could generate almost $150 billion in revenues by 2020. Facebook plans to utilize Oculus Rift as a unique gaming platform delivering a hitherto unknown experience to millions of gamers across the world, and also develop its own communication platform. At the same time, there are other multi-billion dollar tech companies who are also working on their own Virtual Reality Applications. Microsoft demoed a VR headset named Hololens in early 2015. It aims to build not only a virtual, interactive communication platform, but also aid architects and designers to visualize their designs using holograms. Sony has its own pet VR project, codenamed Project Morpheus, and aims to bring VR technology into the home of millions, leveraging its PlayStation and PlayStation Vita game systems. Outsource2india - Where Do We Stand On Virtual Reality? At O2I, our services span across multiple industries and verticals, including Marketing, Healthcare Insurance, Imaging, etc., and we keep ourselves abreast with technological innovations, allowing us to provide timely and highly relevant services to our clients. If you have any ideas for your business where you feel that VR may be able to leverage increased benefits for you, we have a team of professionals who can help you get started. If you have any query regarding virtual reality systems, or would like to collaborate with us in developing your own virtual reality application, Contact us right away!